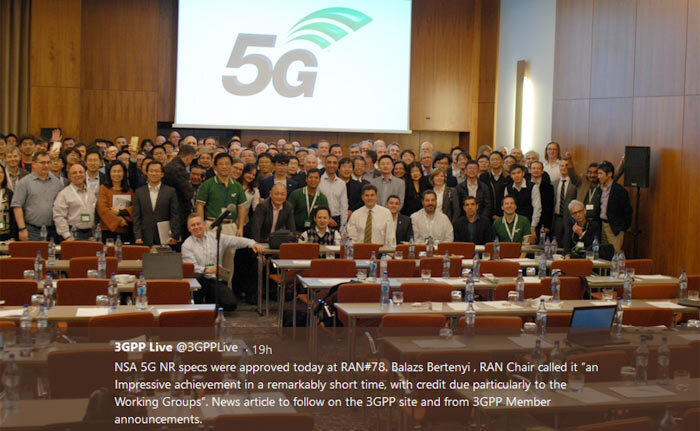 “Today the 3GPP TSG RAN Plenary Meeting in Lisbon, Portugal successfully completed the first implementable 5G NR specification. AT&T, BT, China Mobile, China Telecom, China Unicom, Deutsche Telekom, Ericsson, Fujitsu, Huawei, Intel, KT Corporation, LG Electronics, LG Uplus, MediaTek Inc., NEC Corporation, Nokia, NTT DOCOMO, Orange, Qualcomm Technologies, Inc., Samsung Electronics, SK Telecom, Sony Mobile Communications Inc., Sprint, TIM, Telefonica, Telia Company, T-Mobile USA, Verizon, Vodafone, and ZTE have made a statement that the completion of the first 5G NR standard has set the stage for the global mobile industry to start full-scale development of 5G NR for large-scale trials and commercial deployments as early as in 2019. On February 27, 2017 in Barcelona, global mobile industry leaders announced their support for the acceleration of the 5G NR standardization schedule, which introduced an intermediate milestone to complete the first implementable specification for Non-Standalone 5G NR operation. As a result of this announcement, the schedule acceleration was agreed at the 3GPP RAN Plenary Meeting on March 9 in Dubrovnik, Croatia. This first specification was completed as part of 3GPP Release 15. Widespread commercial deployment is expected to start next year. 3GPP NR spec is NOT a standard as 3GPP itself says it’s not a standards body. More importantly, NR is one of several Radio Interface Technologies that will be presented to ITU-R WP 5D for evaluation and selection of the true 5G/IMT 2020 standard for the Radio Access Network. “3GPP specification” cover all GSM (including GPRS and EDGE), W-CDMA (including HSPA) and LTE (including LTE-Advanced and LTE-Advanced Pro) specifications, and the emerging 5G specifications. “The first version of 5G NR not only provides a NSA solution for 5G deployment but also completes the common part of NSA and SA, which lay a solid foundation for a global unified 5G system with global market scale. We believe the next important milestone that is SA standard providing end to end 5G new capability could be completed by June of 2018, which is very crucial to enable the operators to explore the enterprise and vertical markets. China Mobile is actively working with industry partners for 5G commercialization in year of 2020 and providing various services to customer.” said Zhengmao Li, EVP of China Mobile Group. This entry was posted in 5G and tagged 3GPP. New Radio, NR. Bookmark the permalink. Europe considers 5G an opportunity to promote the whole European economy and the so called “Gigabit Society”. In order to achieve this goal, the European Commission identified some action points and a roadmap to ensure 5G will be a reality by 2020, with Euro2020 football games a showcase for the new system. This paper provides an insight of the European vision to 5G and the steps required to transform 5G from standards on paper to services for the citizenship. Ericsson and Qualcomm, in collaboration with AT&T, NTT DOCOMO, Orange, SK Telecom, Sprint, Telstra, T-Mobile US, Verizon, and Vodafone, showcased 3GPP-compliant 5G NR multi-vendor interoperability during live demonstrations held in both the Ericsson Lab in Kista, Sweden and the Qualcomm Research lab in New Jersey, USA. The successful demonstrations show the companies’ combined strength in carrying out timely trials that pave the way for commercial launches of 5G standard-compliant infrastructure and devices. Ericsson’s 5G NR pre-commercial base stations and Qualcomm Technologies’ 5G NR UE prototypes will enable operators to conduct live tests in their own networks. The over-the-air Interoperability Development Testing (IODT) was conducted for lower layer data connections operating at both 3.5 GHz and 28 GHz bands. These just standardized layers are the fundamental building blocks of 5G NR. NSA 5G NR will use the existing LTE radio and evolved packet core network as an anchor for mobility management and coverage while adding a new 5G NR radio access carrier to enable certain 5G use cases starting in 2019. “One of the most under-reported stories for 2017 is the 600 MHz auction,” T-Mo CEO Legere wrote in a blog post, referring to the FCC’s spectrum auction in April. “While [Verizon and AT&T] focus on 5G hotspots that won’t work when you leave your home, we will be the only ones on the fast-track toward a real, mobile nationwide 5G network in 2020 – and have already started deploying 5G ready equipment,” he says. If his claims are true, it would actually give T-Mobile a major advantage over competing brands. Consumer interest in 5G internet has only grown in recent years, and it will likely continue as the demand for faster internet everywhere climbs higher. According to the blog post, Legere seems to think that T-Mobile is ahead of its rivals because its focusing on building a network that can transmit these blazing internet speeds, anywhere, wirelessly. It would certainly come in as good news for T-Mobile. Verizon is currently the largest wireless telecom service provider with 149 million subscribers, followed by AT&T with 138.8 million subscribers. T-Mobile has 70.7 million subscribers. 3GPP New Radio (5G NR), release 15 reallocates some existing LTE bands and introduces new mmWave bands up to 40 GHz. While initial 5G devices will implement some type of point-to-point wireless link, smartphone manufacturers are already planning the introduction of their products that contain multiple radios. Adding yet another radio adds new coexistence challenges that designers must address. Balazs Bertenyi, TSG RAN Chairman: The 3GPP non-standalone (NSA) 5G radio specifications, which means that you need an LTE anchor and besides that LTE anchor, you have the 5G NR cell, but you basically do your control plane & control plane communications through LTE and you boost the user data capacity through 5G NR and the new radio technology. What we have to recognize is that to make the full 5G vision a reality takes time, it takes multiple phases, it takes multiple [3GPP] releases – just as it did with LTE. So, the full 5G vision is really one with the multiple pillars that guide the overall system development for the next ‘x’ number of years. So, this is where the slight disconnect comes from “OK, 5G’s wonderful, but the first release only provides mobile broadband”, but what I think we have to recognise is that you cannot fulfil the full vision [of 5G] in one go. You have to start somewhere and you obviously want to start at an area and at a set of features that you can deploy. Otherwise, how would you gain experience with the new technology? From autonomous driving, to all of those industry verticals that we want to target with our technologies. That is really what will make 5G a success, we cant be constrained by the LTE footprint, we have to go way beyond that. That’s the only way that we can make 5G a success. Erik Guttman, TSG SA Chairman: The 5G system is being developed largely as a new 5G core network and all of the components of that network are being considered – both in terms of the functionality they will provide for the NR and other accesses, but also in interaction with the EPC (Evolved packet core) and the entire 4G system. We are going to have compatibility going forward, as people adopt the new technology. The new 5G system features capabilities that will allow for orchestration of virtualization, as the components are redesigned to offer a very cleanly separated control plane and user plane – It adopts an internal signalling architecture that’s novel. So, rather than following distinct paths it is a service based architecture, though it support all of the procedures and mechanisms needed to provide mobile telecommunications, these same capacities can be used for other services that can be offered by operators, in the future. I think that we are in very good shape for the months to come and it will be an exciting challenge to get through both phase 1 and phase 2 of this initial 5G process and I am very confident that we can achieve the targets that we set out too – for IMT-2020 and even exceed many of those goals.